We selected this beautiful Spiel Caravan by Dunster house for Tilly and her sisters, so that they would have their own fun place in the garden for imaginative play. 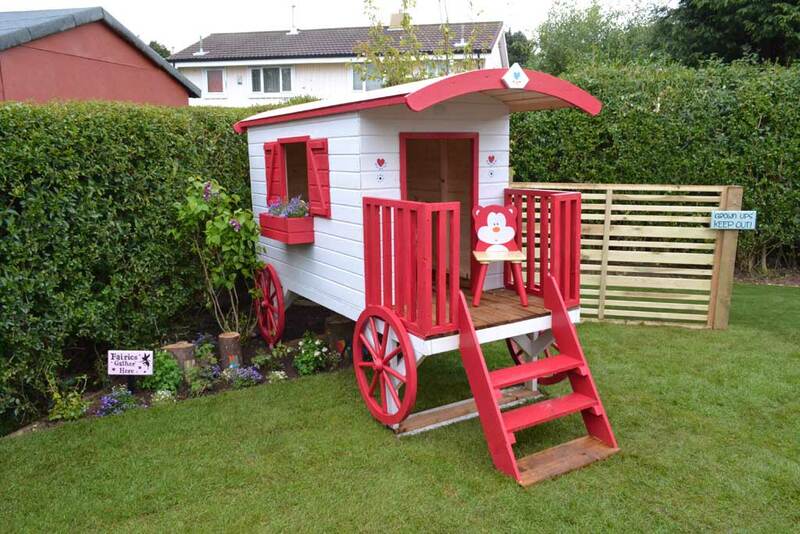 This pretty little caravan is perfect for even the smallest garden, measuring 1.1 x 2.9m. With its own balcony, flower box, step ladder and choice of colours to treat your caravan, your children can be transported into their own magical land in the safety of your own garden! Suitable for ages 3-10 years your children will feel they have a place of their own, just like Tilly and her sisters. All timber in the Spiel Caravan comes with a 10 year guarantee and all nuts and bolts have protective caps for extra safety. Alan and the team wanted Tilly and her family to have a beautiful, large garden building which could double as a craft room and a dining space. Malvern Timber Frame Buildings came up with this amazing design for them. 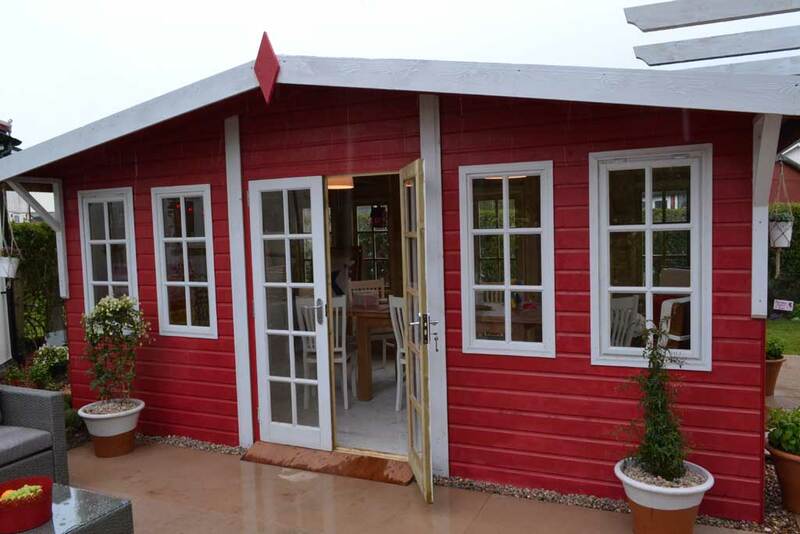 They have a fantastic range of garden buildings, sheds, stores and garages…but are also experts in bespoke buildings. Tilly’s House has beautiful Georgian safety glazed windows and doors on 3 sides – allowing Tilly to access it in her wheelchair all the way round plus letting light through it, so it doesn’t seem such a large building. We had a choice of different roofing materials, roof pitch and selected a lovely grey laminate floor. We selected the Urban Screen Panels by Grange Fencing to separate the football and games area of the garden because it provided screening, without being a solid fence. The unique and stylish slats of differing sizes added a contemporary edge to the garden. This was part of Grange Fencing’s new ‘Urban range’ of stylish garden products and it comes in 2 sizes: 1.8 x 1.8m and 1.8 x 1.2m – we had the latter, to keep the family’s area sectioned off, but enabling Tilly’s parents to see the children when playing. There’s also a fabulous matching arch in the range. Each screen is pressure treated to help aid in protection from the elements. 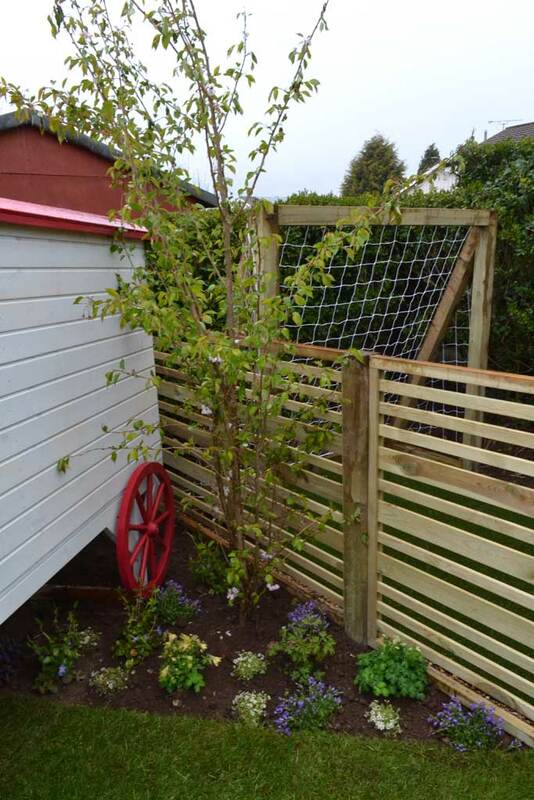 Grange Fencing also supplied all of the components for the pergola – no need to buy a kit if you have a tricky area to site a pergola – or if you want to freestyle it and create your own! 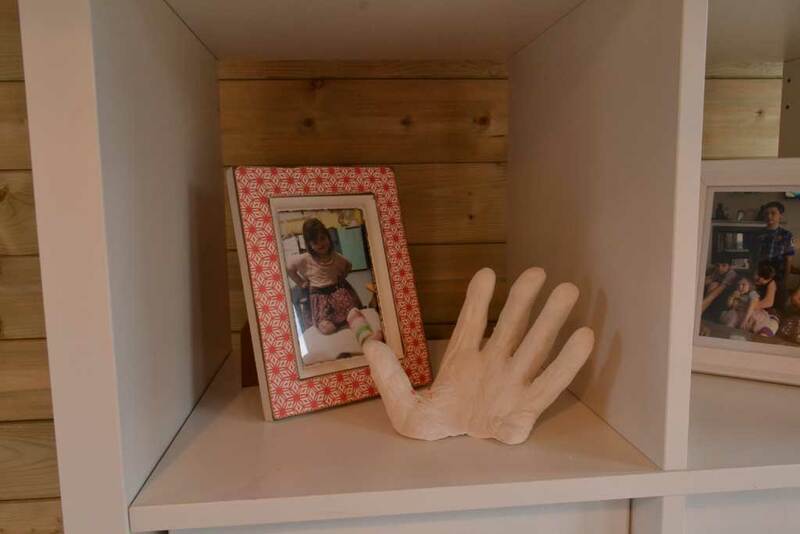 We selected a hand resin kit from Hobbycraft to make casts of Tilly’s grandparent’s hands as a lovely keepsake. They are really easy to use and the results are fantastic. Hobbycraft also supplied Tilly and her brother and sisters with a huge amount of craft items – from painting equipment, stamps, pens, paper, card, stickers and glitter. They also supplied the lovely animal table and chairs which went in the play caravan and lovely, bright storage containers for all of the craft items to tidily pack away into. They are our go to place for all things crafty. 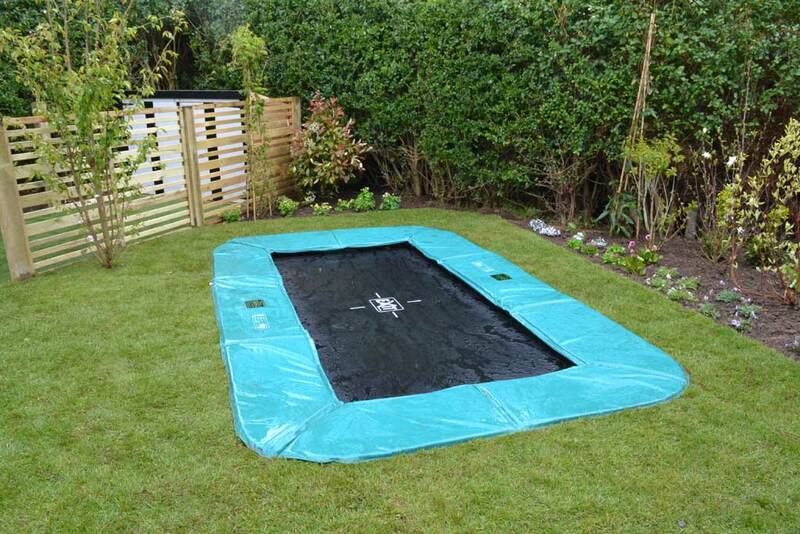 One of the things Tilly asked Alan for was a trampoline in their garden. Who could not resist granting Tilly her wish? We selected the Inground Trampoline by Sunken Trampoline because it was perfect for Tilly and her siblings. Due to Tilly’s mobility issues, an above ground trampoline wasn’t suitable for her. The team at Sunken Trampoline suggested we use one of their Inground trampolines as it would be safe and also unobtrusive to look at. All of their in ground trampolines are deigned for purely being sunk into the ground, in some cases they have powder coated high steel frames, all have vented jumping mat’s and vented safety padding along with their own retaining wall. Sunken Trampoline installed it and lined the hole dug for the trampoline with a weed-proof membrane and installed a soak-away to allow rainwater to easily drain away. 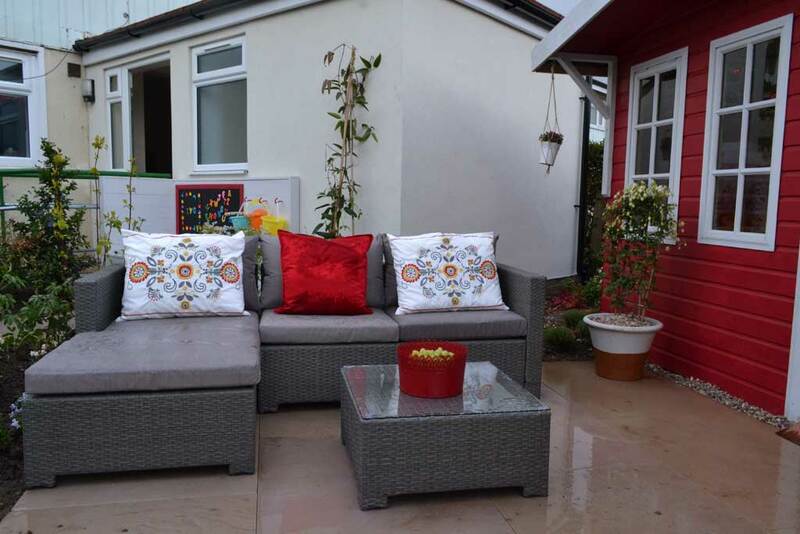 We selected this stunning Messina Corner Sofa Set for the Sawford family, to give them a place to relax and chill out in their new garden. With it’s stylish design and neutral colours, it complimented the look of their garden. They can sit back and relax in both style and comfort to soak up the glorious sunshine in their garden. The L shaped sofa design is both practical and spacious, allowing enough space to sit comfortably with friends and family on soft and supportive sofa cushions. They can sit out with drinks or dinner on the handy matching coffee table, covered with a luxury glass table top. This sofa set gives them the comfort of their living room out into the garden. It’s fantastically priced at only £299.